On Sunday, June 27 Trinity welcomed thirteen new members – eight through baptism. All new members just completed a multi-week Basic Christianity Class. 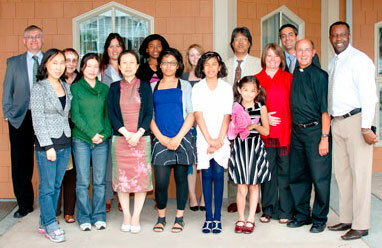 The above photo shows some of the participants in the class plus family members. A New Vicar for Trinity! On May 8th, during the Placement Services of Pastoral Candidates and Vicars at Concordia Lutheran Theological Seminary in St. Catharines, Ontario, Wei Ge (Wayne) Zhang was "placed" as a Vicar to our congregation for the 2010-2011 Seminary Year. A number of free, fascinating, online video Bible Study presentations have been produced by the Lutheran Hour Ministries on the Men's Network. Check out new links in the "Links" section of the Main Menu! "On The Road" is a blog of the travels, sights and people experienced by various executive members of Lutheran Church Canada as they go to all corners of the globe visiting missionaries, congregations, and fledgling synods and church groups. Read their stories as they witness first hand the activities of Christ's church body in other parts of the world. "InfoDigest" is a news and information service of Lutheran Church Canada for activities and events happening in Canada and throughout the world. This is one of the quickest methods to keep everyone informed. "The Canadian Lutheran" is the official magazine of Lutheran Church Canada. Current and past issues can be read online. A number of other links have been added as well. All kids and adults will enjoy a fun, new DVD series that will cover the entire Bible from Genesis to Revelation. March 4, 2010 – The following is a letter from Lutheran Church Canada President Robert Bugbee. It describes the situation in Chile in the days immediately following the earthquake on February 27, and the need for prayer and assistance. March 25, 2010 – A report on the current situation in Chile has just been released, one month since the earthquake disaster struck on February 27. Read it here. Every Tuesday morning from 7:00 to 8:00 am, men take turns preparing breakfast (often with a little help from their wives) and enjoy a short Bible Study led by Pastor Harold. The current study is "Heroes of the Bible: Life Lessons for Today's Man". What a great way to start your day, and you can still get to work on time! Every Wednesday at 10:00 am, the ladies get together to study various Bible topics. Led by Don Hindle. An in-depth bi-weekly Bible Study on Thursday evenings with homework. Check the monthly calendar. Contact Nadine for more information or read more here. Take a look at the new "Links" link in the Main Menu above. This is a gathering of many links associated with the Lutheran Church and is regularly updated. If you know of a web site that you would like to see on this page, and it isn't there yet, please send a message to the Webmaster under "Contact Us". Thank you! This page is for news from Lower Mainland and regional newspapers about LCC activities in and around Vancouver/Richmond.